Can Solar CSP Be Integrated With a Fossil Fuel Plant? Gigawatts of concentrating solar power could be built and integrated into existing fossil fuel plants, according to the DOE. Can coal and natural gas play nicely with solar power? 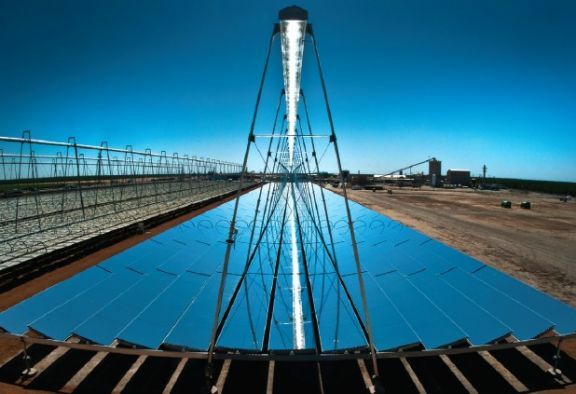 Can hybrid CSP-fossil fuel accelerate the commercialization of concentrating solar power? The DOE, as part of its SunShot program, is devoting $20 million to potentially integrate concentrating solar power (CSP) systems with fossil fuel power plants -- aiming for a CSP-natural gas or CSP-coal hybrid which generates power at approximately $0.10 per kilowatt-hour levelized-cost-of-energy without any subsidy for solar. The DOE solicitation looks to fund two to four projects, each with greater than one megawatt of solar generating capacity. 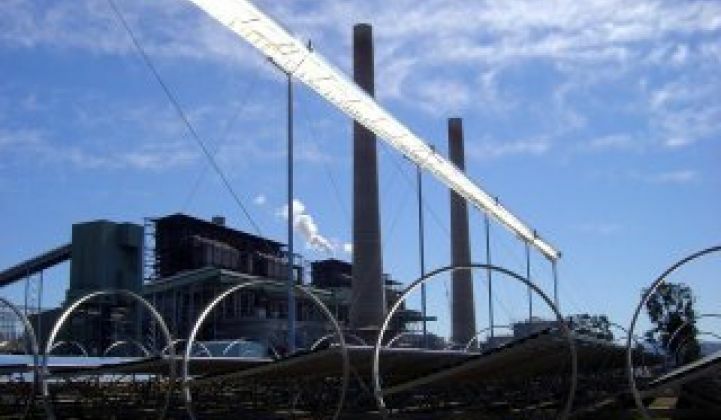 A typical Integrated Solar Combined Cycle (ISCC) system would use steam generated by a solar field coupled to a conventional coal or natural gas-powered steam plant. The steam generated by the CSP plant can be injected into the turbine of a natural gas or coal plant, be used to preheat the incoming gas stream for a combined cycle plant, or perform a thermochemical process on natural gas or coal to boost the efficiency of the fuel. So why build a hybrid plant instead of a standalone fossil-fueled plant? The DOE is looking for an increase in nameplate capacity, improvements in heat rate, reduction of fuel consumption or O&M cost, or reduction of emissions. Projects must have a commitment from a power off-taker to purchase the electricity generated. Tucson Electric Power (TEP) is working with Areva Solar on a CSP "booster" to the 156-megawatt Unit 4 at TEP’s H. Wilson Sundt Generating Station in Tucson. The Sundt plant is a dual-fueled unit capable of using coal or natural gas. The Solar Boost Project will use Areva Solar’s Compact Linear Fresnel Reflector (CLFR) solar steam generators to produce up to 5 megawatts of power during peak power demand. Areva acquired the CLFR technology from KPCB-funded Ausra back in February 2010. The Sundt Solar Boost Project is part of TEP’s plan to expand its solar generating capacity to more than 200 megawatts by the end of 2014 in an effort to meet the Arizona RPS of 15 percent by 2025. 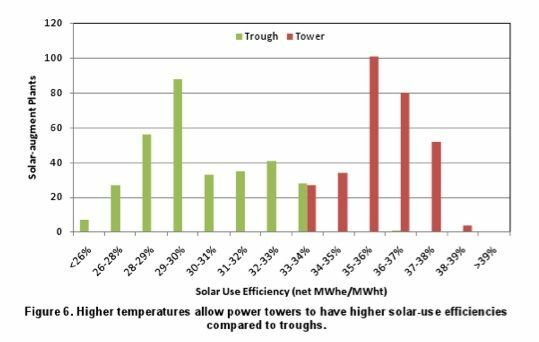 According to a 2011 report from NREL entitled Solar-Augment Potential of U.S. Fossil-Fired Power Plants, solar power towers are, unsurprisingly, more efficient than trough designs and better candidates for hybrids. With the price of natural gas at or near record lows, an ISCC plant is just not competitive -- although it's still more competitive than stand-alone PV or CPV according to the NREL report. It is still early days for hybrid-CSP. Right now, there is little pure financial reason to invest in this type of project. On the subject of CSP, here's a CSP Top Ten of 2012, an article about CSP in Enhanced Oil Recovery, a word from SolarReserve on energy storage, and a piece on BrightSource Energy and the CPUC.